Thousands of Texans who voted in 2010 did not come back to do it again in 2014, and most of those voted for the Democratic candidate for governor four years ago. At the same time, another kind of voting — mail ballots — is booming. Say this for the state’s new voter ID law — it gave Texas Democrats a patsy for the thumping they took on election night. Some Democrats blamed the law for keeping their voters at home last week. At the same time, another type of voting was growing — one that is historically more likely to result in election fraud. In his bid for re-election last week, Sen. John Cornyn finished 27.2 percentage points ahead of his Democratic opponent, David Alameel. Attorney General Greg Abbott, a Republican who led every public poll conducted during the race for governor, proved those surveys right, finishing more than 20 percentage points ahead of the much-vaunted Wendy Davis, a Democrat. Abbott finished with more raw votes and a higher percentage of the total than Gov. Rick Perry in 2010. Davis finished with both a lower percentage of the vote than her 2010 counterpart, Bill White, a Democrat, and a lower vote count. The overall number of votes cast in this year’s election was less than in 2010 — by about 271,000. Although that appears to be part of a national trend, Texas Democrats blamed the state’s voter ID law, which they say discourages people from showing up. Texas turnout, already the worst in the country, dropped. The state’s population is larger than it was in 2010. More than 14 million Texans registered to vote, according to the secretary of state — up from 13.3 million in 2010. Turnout that year was 37.5 percent. Turnout this year (the numbers are unofficial) was 33.6 percent. The people who did not show up appear to be Democrats. The Republican numbers were up in the governor’s race, while the Democratic numbers were way down. At a post-election discussion last week, Gilberto Hinojosa, chairman of the Texas Democratic Party, suggested the voter ID law might be to blame for the decline, implying that Democrats are more numerous among non-voters than Republicans. His opposite on the Republican side — Steve Munisteri — guffawed at that, instead crediting his own party’s turnout efforts, the state’s recent voting history and the national trend against Democrats. Munisteri skeptically answered a question about whether Texans should be allowed to register and vote on the same day. He fears that would introduce an opportunity for fraud — the same concern cited by proponents of the voter ID law. Actual cases of the type of in-person voter fraud targeted by that law are scarce. And it will take some time to know whether the new law was to blame for the decline in voter turnout. A federal judge ruled the law unconstitutional last month, and the state is appealing that to the 5th U.S. Circuit Court of Appeals. The U.S. Supreme Court has allowed the state to leave the law in place while the appeal proceeds. 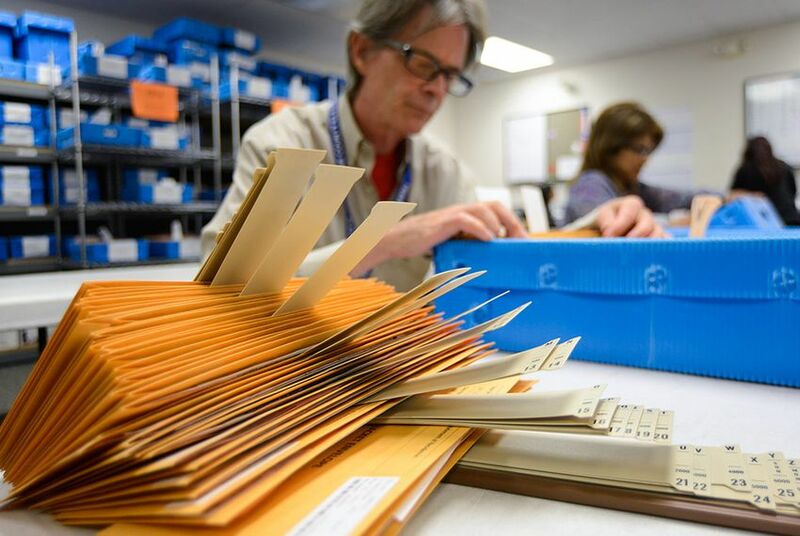 Meanwhile, more than one in 10 early voters in the state’s top 15 counties did so by mail; 12.3 percent this year, according to the secretary of state, compared with 7.8 percent in the 2010 election. Voting patterns are different in presidential election years, but 6.4 percent of 2012’s early voters mailed in their ballots. The state does not track mail ballots in real time, leaving that duty to the counties, which will report the information in a few weeks. Both parties have bragged about their efforts to increase voting by mail, especially with voters older than 65. A new law allows those voters to request a mail ballot early in an election cycle and to automatically receive ballots for every other election in that cycle. They receive ballots for runoffs and special elections that they might not have even known about in previous years. As they argue over voter ID and whether the fraud that law is intended to stop even exists, the inquiries over mail ballots have barely begun, and do not offer much ammunition for those who wanted a different result. Abbott defeated Davis by 957,973 votes. Even if those missing 271,000 Texas voters — the ones who voted in 2010 but not this year — had shown up, and even if they had all voted for the Democrat, she still would not have defeated Abbott — or even matched White’s total in 2010.